When is it recommendable to have surgery on carpometacarpal osteoarthritis (rhizarthrosis)? Does surgery on the thumb saddle joint mean joint fusion? Does surgery on carpometacarpal osteoarthritis involve the implant of an artificial joint? What are the long-term issues connected to an implant of an artificial joint? How can one avoid issues with limited durability of artificial joints used in thumb saddle joints? If I cannot make up my mind to agree to surgery, will postponing the procedure lead to disadvantages later on? Surgery should be considered in cases of persisting or even increasing pain in the thumb saddle joint, if previously administered conservative therapy did not bring any relief. Another reason to opt for surgery is when the adjacent joint – the thumb basal joint – shows signs of increasing and disruptive overstretching. No! In former times fusing a joint as treatment for carpometacarpal osteoarthritis used to be common practice. Today most hand surgeons only in exceptional cases practice arthrodesis, for example in case of osteoarthritis as a result of an accident. Theoretically this is possible and some hand surgeons indeed do practice this approach. Why do only few hand surgeons perform this procedure? Is the implanting process that difficult? Implanting a prosthesis into a thumb saddle joint certainly is not more difficult than the more commonly selected standard procedure preferred by most hand surgeons. Many hand surgeons dislike this approach because it often seems to bring favorable results during the first years – only to create a number of issues linked to the prosthesis in the following years. Even progress in design and material used in artificial joints cannot take away from the fact that an artificial joint only has limited durability vs an organic joint meaning that sometime down the road an oftentimes complicated replacement procedure may become inevitable. Artificial joint implants may become loose, some may break, others may get pushed out of their correct position (luxate) due to the huge amount of strain placed onto the thumb saddle joint. All these scenarios will make an additional surgical procedure unavoidable. Such follow-up procedure oftentimes bears a variety of risks. The image above shows a possible complication related to a required second intervention. The prosthesis could only partially be removed. The shaft of the prosthesis remained in the thumb as it grew tight with the bone and could not be removed. 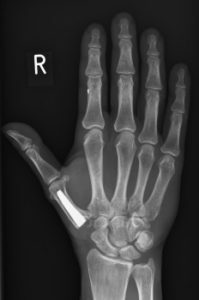 Most hand surgeons prefer procedures that imply the removal of the trapezium bone while fixating the thumb with a tendon. My guess is that about 90% of hand surgeons select this approach along with its variations. The aforementioned surgery is referred to as Epping resection-suspension arthroplasty procedure. Typically there are no disadvantages in postponing surgery on rhizarthrosis. After all, the procedure aims at removing the thumb saddle joint to replace it. (Regardless whether by tendon material or artificial joint). The degree of damage caused to the joint due to carpometacarpal osteoarthritis does not impact the result on the newly constructed thumb saddle joint. Only if there is a tendency to overstretch the thumb basal joint one should not wait too long to avoid hyperextension deformity of the thumb. In summarizing, surgery on a thumb saddle joint should only seriously be considered if you suffer of persisting and life quality altering discomfort.